Tottenham Hotspur plc published its summary figures for the year to June 2010 this morning. We'll have to wait a few days until the full report and accounts are published to get all the details (like an accurate number for the wage bill) but the press release covers most of the key points. Excluding transfers, Spurs is reasonably profitable at the operating level. The club focuses on "operating profit" (which includes depreciation), but I prefer the more commonly used EBITDA which rose 20% to £25.4m from £21.2m the previous year. The profit improvement was driven by turnover up 6% whilst operating costs were only up 3%. Almost all the increase in turnover came from higher PL TV receipts. Although the total paid to all 20 clubs only increased 5%, Spurs' share increased 16.4% due to their fourth place finish and higher number of broadcast games. This increase in PL TV income offset falls in gate receipts and corporate hospitality due to the club not qualifying for Europe the year before and therefore only playing 24 home games (vs. 28 in 2008/9). Merchandising and "other" income both rose sharply. In these figures we do not have details of how the £94.4m of operating costs split between wage and non-wage expenses. In total however, operating costs only rose 2.8%. Assuming non-wage costs were flat (as they were the previous year) we can estimate that wages only rose 4.3%, which is commendable and better than the 7% growth seen at Arsenal and United. The profit on player sales was down sharply from £56.5m to £15.3m. This reflects the very profitable sales of Berbatov and Keane in 2008/09, compared to those of Darren Bent, Zokora and Boateng in 2009/10. The amortisation charge continues to rise albeit slowly (this is the cost of transfer spending spread over the length of players contracts and is an important component of the new Financial Fair Play regulations). The amortisation charge was £39.5m up 3.6%. 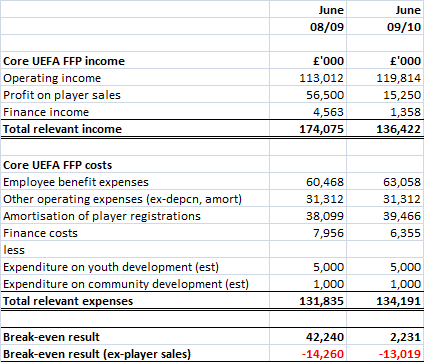 Actual net cash spending on transfers was £27.5m, more than the club's EBITDA. Net interest paid rose to £5.0m on gross debt of around £90m (up from £80m). The club issued £15m of new shares during the year. 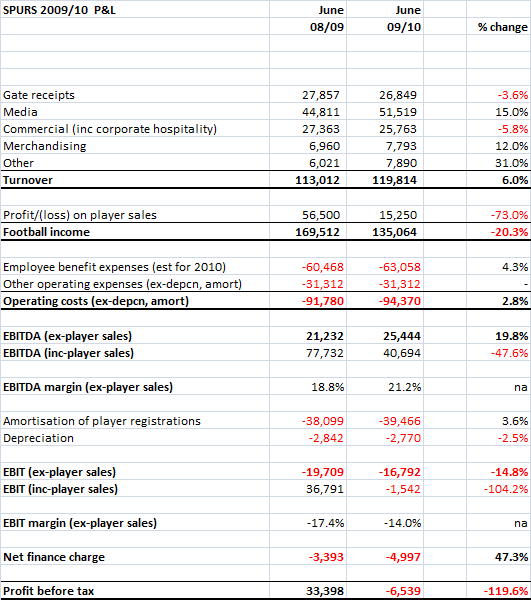 So the £25m of EBITDA was insufficient to cover the £5m of interest and the £27.5m of net transfer spending. The gap was small, but existed despite Spurs having the lowest wage bill of any of the clubs with a realistic ambition to achieve a top 4 finish. 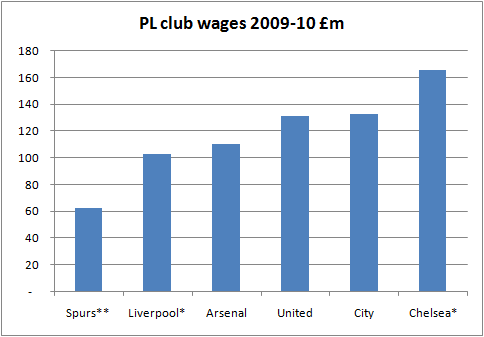 Spurs' wage bill of c. £63m makes it a minnow compared to the "big 4" and City (see table below). Having broken into the Champions League, Spurs' financial and footballing challenge is to maintain a good enough squad to stay there (or at least have a good chance of achieving a top 4 finish each season). This season, Spurs will benefit from at least three Champions League home games (and almost certainly at least one knock-out stage game) as well as the TV income from the competition. The club do not publish a total "matchday" number and include corporate hospitality in their "Commercial" turnover but assuming gate receipts account for 75% of total matchday revenue, each home game is worth around £1.5m in additional income. Assuming elimination in the first knockout round of the competition, the club will earn around £6m in matchday income and around €30m (c. £25m) from UEFA TV money. The dual Autonomy/Investec shirt deal is reported to be worth £25m over two years, representing an increase of c. £4m pa on the previous sponsorship by Mansion. Like all Premier League clubs, Tottenham will receive an additional c. £5m from the new overseas PL deals. Assuming a roughly consistent domestic performance, Tottenham should earn c. £40m more than last season. This Champions League bonanza could clearly help finance a squad with more strength in depth, one able to compete both domestically and in Europe. History shows that relying on continual Champions League football is highly dangerous (see Liverpool or Leeds) and Daniel Levy is too smart to fall into this trap. Whilst this season's CL run is very helpful (even if the wage bill rises this year with the arrival of van der Vaart and Gallas), Tottenham need to close the earnings gap with United, Arsenal and Chelsea who have turnover £84-167m higher. Beyond playing performance related revenue, this means building a bigger stadium. Last season, White Hart Lane was full to 98% of its theoretical capacity for the club's 24 home games. The waiting list (a proper one which fans have to pay to be on) is 33,000 or 90% of the Lane's current size. The comparison with Arsenal is instructive, with the Emirates bringing in £3.5m per home game vs. Spurs' £1.5m and with Arsenal's blended revenue per seat around £58 vs. Spurs' c. £42 (reflecting fewer and lower quality corporate facilities at WHL). A new stadium could allow Spurs to increase their matchday income by around £40-50m per annum, easily giving them the means to pay the £100m+ wage bill their competitors can afford (or in City's case can't). The stadium question links to how well prepared the club are for UEFA's Financial Fair Play rules. On my estimates (see table below), Spurs would have squeaked in last season by £2m, but were reliant on their profit on player sales to do so. This season the CL income will easily cover any shortfalls, but the margins are tight in years when they aren't in the European Cup. So the big question for a prudently run club like Tottenham is can they finance and build their new home? Liverpool fans know how hard it is to do and there is no Highbury-like property bonanza to be had in N17. Debt is already at £90m, albeit much of this has funded property investment around the ground. Without the additional income that a new ground would bring, it is hard to see Spurs competing consistently with the big boys. The alternative is relying on Redknapp's wheeling and dealing and accepting the role of a feeder club (G. Bale anyone? ).